Tough Test Questions? Missed Lectures? Not Enough Time?Fortunately, there's Schaum's.More than 40 million students have trusted Schaum'sto help them succeed in the classroom and on exams. Schaum's is the key to faster learning and higher grades in every subject. 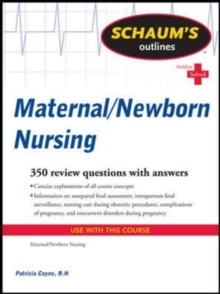 Each Outline presents all the essential course information in an easy-to-follow, topic-by-topic format. You also get hundreds of examples, solved problems, and practice exercises to test your skills. 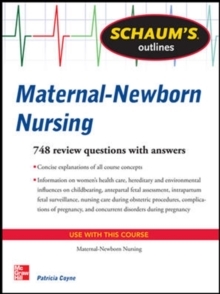 This Schaum's Outline gives you:700 review questions with answersEssential information on pregnancy, labor and birth, and care of the newbornSupport of all the major textbooks in the field ofmaternal-newborn nursingFully compatible with your classroom texts, Schaum's highlights all the important facts you need to know. Use Schaum's to shorten your study time--and get your best test scores!